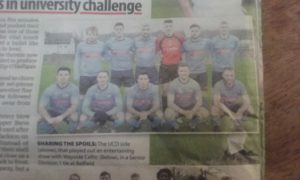 UCD and Wayside Celtic opened the door on the second half of the season in timid fashion as they split the Senior Division 1 points at Belfield yesterday. By the end of a laborious 90 minutes a point each was a fair reflection on the morning’s exertions that neither side did enough to win, but neither deserve to lose. The tie burst into life with both goals arriving in the opening ten minute, but never built on their early promise and the sides walked off the soft Belfield turf content enough to start 2018 in positive form. The point helps little in the grand scheme of the league table. UCD stay well of f the chase at the top while Celtic keep their bow out of the choppy waters of the relegation battle. College opened their account for 2018 within five minutes of the start with a goal that was selected straight out of the category bizarre. Conor Cannon skipped across the pitch before laying the ball wide to the feet of Michael Whelan, The College winger collected the ball on the right wing, got a yard of space and curled in a low centre of little pace. The ball was swung across the face of the Wayside goal, missing defenders and attackers alike, while goalkeeper Ger Doran was also deceived as the cross crept in off the base of the upright and into the net. It was a soft goal, but that wasn’t bothering Whelan. Wayside, who are just one rung of the ladder away from the relegation zone, were back on level terms within five minutes. The Celts won a corner and pushed their big targets forward. It was one of those targets that provided the vital touch as Thomas O’Hanlon fired a bullet like header by Gavin Sheridan to level. Wayside were hard on the throttle now and Sheridan needed to be alert to produce a smart save to keep out Philip O’Halligan from close range. Peter Lennon’s side continued to churn plenty of change out of their set-pieces and O’Hanlon was denied by another fine Sheridan stop. Brandon Byrne followed up, but his shot was deflected away from goal as College survived. The home side suffered a heavy blow on the hour mark when skipper Steve Dillon was shown a straight red card after becoming entangled with Joe Jackson on the edge of the College area. Instead of retreating, College came out of their shell after Dillon’s dismissal and went close on a couple of occasions to going back in front. Both sides continued to plug away, but a winner was too shy to appear. 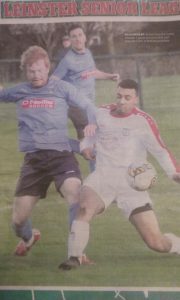 These two have a chance to settle the score next weekend when they meet again, this time in the Cahill Cup.